Wow, what’s with all these royal figures being forgotten/minor in Disney films?! First, we had Queen Leah, then Princess Eilonwy, then the Princess of Glowerhaven, and now this one! It’s true when they say that you can’t have it all! 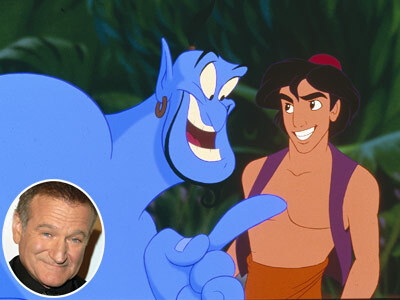 Released in 1992, “Aladdin” continued the trend of the animated films of the Disney Renaissance, i.e. making a bunch of money and getting a bunch of positive reviews from critics and audiences alike! 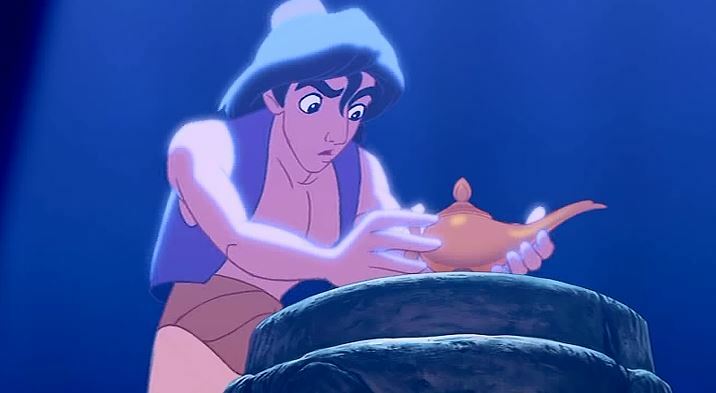 The 31st film in the Disney Canon tells the story of Aladdin, a boy…umm…man…umm…teen…umm male hero who finds a magic lamp in “The Cave of Wonders”. Rubbing the lamp causes him to have his very own Robin Williams following him about throughout the whole movie! 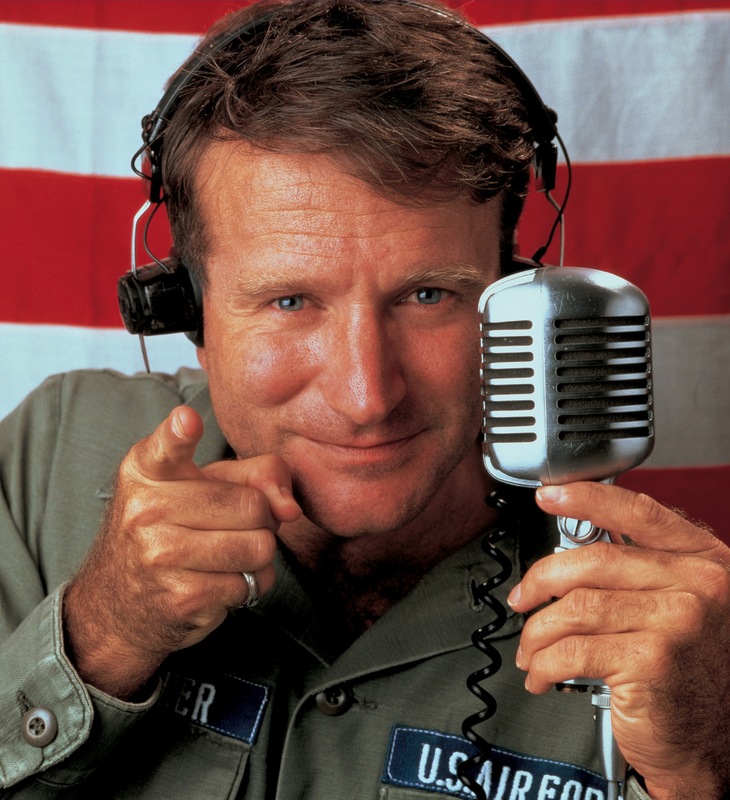 Well, ok, he doesn’t have his own person Robin Williams; but he does awaken a blue genie voiced by Robin Williams! 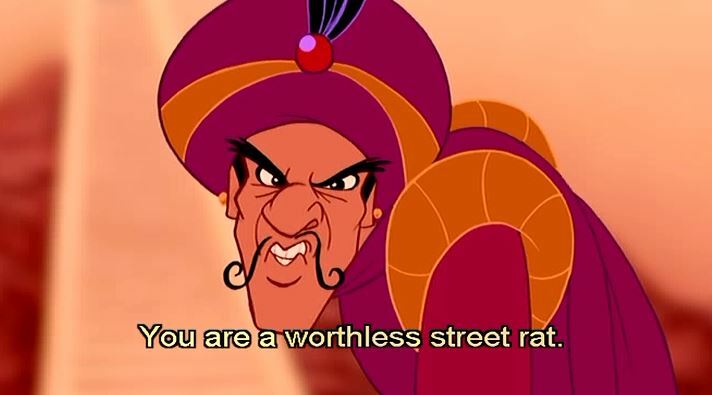 The Genie tells Aladdin that he is his master and that he’ll grant Aladdin three wishes. Inside every blue genie is a sometimes funny, sometimes annoying comedian ready to grant you three wishes with restrictions and a guilt trap to force you to use one of the wishes on him! Get your genie today! 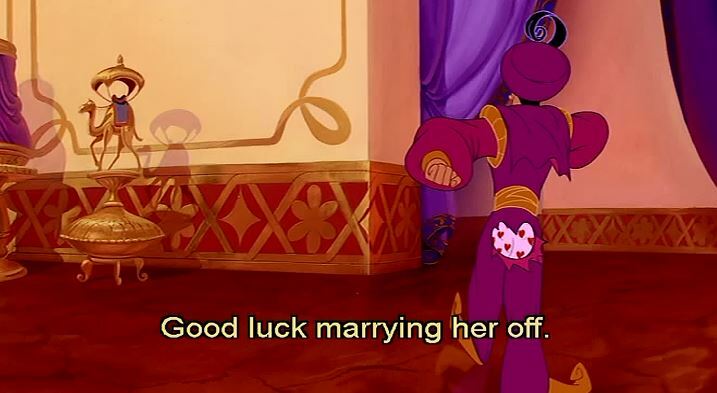 Aladdin decides to use his wishes to indirectly cause the beautiful princess Jasmine to fall in love with him. And the rest of the movie is their romance while an evil villain, Jafar, plots to take control of the kingdom with the help of his very own Gilbert Gottfried! Tell me that image doesn’t unnerve you! The movie is memorable and beloved, the songs are memorable and beloved, and the characters are memorable and beloved. So there came the predicament of choosing a forgotten/minor character for this film. I then decided to go with Prince Achmed. You see, Princess Jasmine, has to be married by her next birthday; but she wants her marriage to be akin to a fairy tale romance. This doesn’t stop suitors from coming to ask for her hand though; and one of these suitors is our friend, Prince Achmed. What do we know about him? Well, we know that he’s a bit arrogant. The real reason why Ratigan turned evil! We know that he’s interested in the princess. Even the directors acknowledge this! 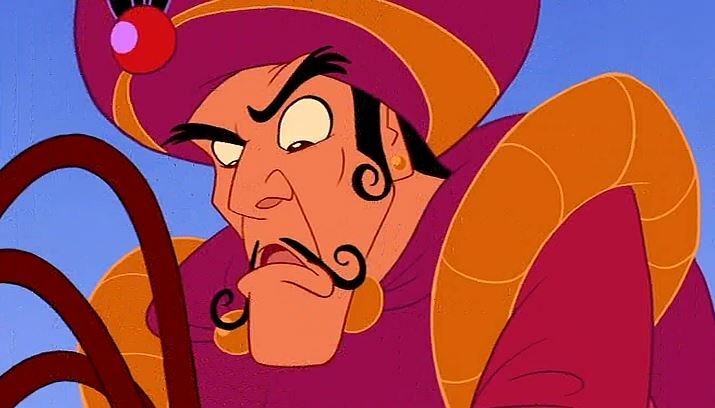 And we know he has the stereotypical curly “evil man” mustache, thereby making him an evil man! 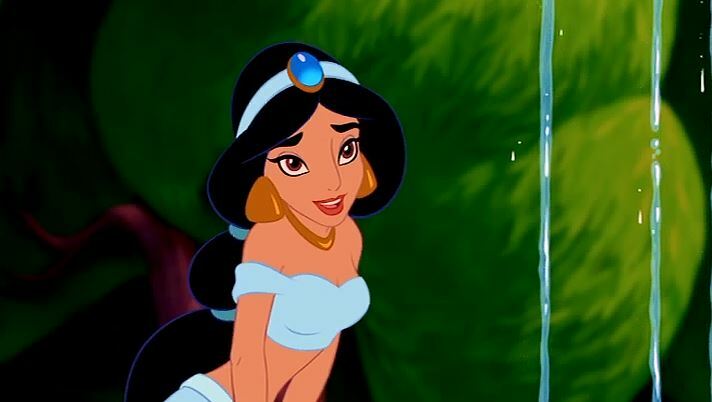 So it’s no wonder that our Prince Achmed’s turned down by Jasmine! He leaves the palace furious and just as arrogant, and is never seen again! 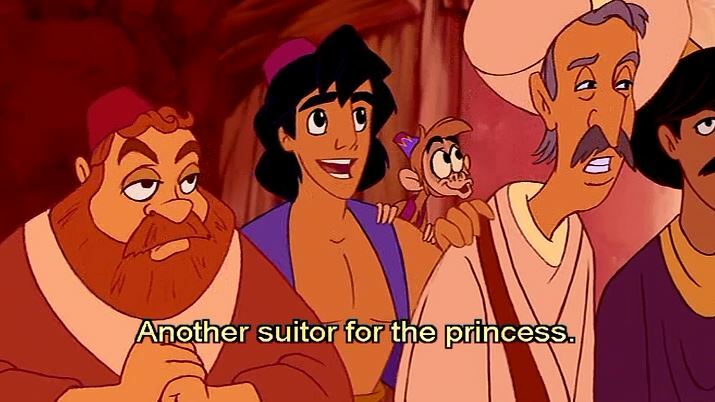 I wonder if he even got invited to Aladdin and Jasmine’s wedding! Whatever the case, I’m sure our Prince Achmed is taking care of himself, and I’m acknowledging him as the forgotten/minor character for this film! Lol, thanks! 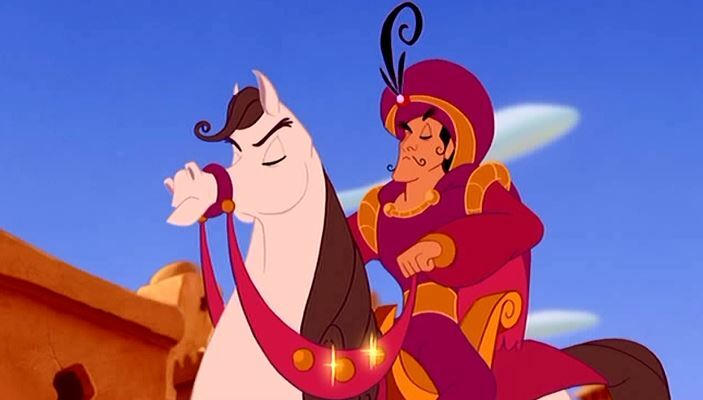 The picture of Jafar and Gilbert was found on Google Images and I actually had to crop the picture because Gilbert was drawn naked atop Jafar’s shoulders and we don’t want to see that, lol! This is one of my favorite Disney movies ever, so thanks for featuring Prince Achmed. He got what he deserved. And so true about the curly mustache–a villainous characteristic if ever there was one. And yes, I am unnerved by that GG image. 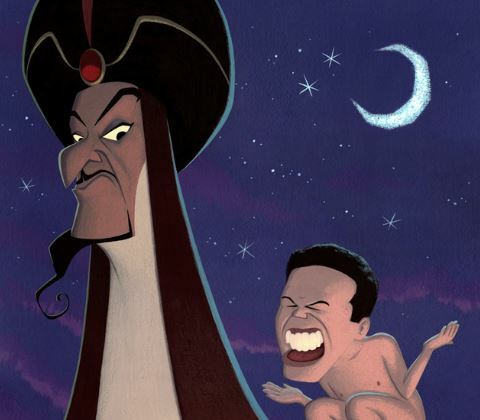 I had to crop the GG image because he was actually drawn naked on Jafar’s shoulders and…nobody wants to see that, lol! I really wish that we could of seen Jasmine’s interaction with Achmed that would of been interesting. Yeah, oh well. It’s best left to our imagination…or to the imagination of a student animator who needs to make a quick short film for a project. Ugh, that GG image will haunt me forever. Why would you punish us like this? Anyways, while the movie does have a few plot holes, it is one of my favourites. I like the characters, songs, everything. Prince Achmed isn’t really forgotten but compared to anyone else in the film, he is. He is arrogant and an ugly design. Nothing else to say. Yeah, compared to everyone else, he was the most forgotten character. Lol, and I just had to show the GG image. I actually had to crop the image, because it showed more of his body that we didn’t want to see, lol. Hi, an Aladdin fan from Asia here. This article is just quite nicely done, and you have to be quite a Disney geek to be doing this haha. Not saying that it is bad for I am one as well. And yeah, the Gilbert Gottfried picture can be quite disturbing LOL. Hey, welcome to the blog and thanks for commenting! Always awesome to find fellow Disney geeks 😛 ! I’m not sure who/what Starkid is, but yeah, Prince Achmed is definitely forgotten/minor. Starkid is Team Starkid, they made a Aladdin themed musical called Twisted where Prince Achmed is actually a big character. One of the songs is titled ‘No One Remember Achmed’. 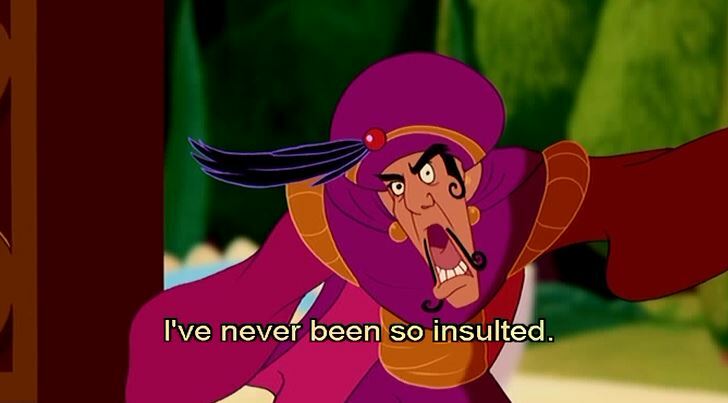 As much as I love ALADDIN, it behooves me to confess that there is one thing about it that bothers me quite a bit: the utter lack of cultural authenticity. When you think about it, the film is chock full of Orientalist stereotypes of Islamic culture, and there is not a single actor of Arab or Persian ancestry in the cast– with the exceptions of Lea Salonga (who is Filipina) and Gilbert Gottfried (who is Jewish-American), the cast is so overwhelmingly white. I say all of this because I am of Middle Eastern ancestry myself (Persian, on my father’s side, to be precise), and it has come to irk me to no end that there are practically no examples of accurate portrayal of Islamic culture in mainstream media– including feature animation. I’m the same. While I don’t fully believe that voice actors should be the same ethnicity of the characters that they’re voicing since it’s just a voice performance, I do agree with you on the Islamic context of it. As you know (or may not know), I am a Muslim, so it is annoying at times to not see true Islamic life/beliefs being portrayed in the film and just, as you said, Orientalist interpretations being portrayed. (The guy wanting to cut Jasmine’s hand, for one, is a scene that doesn’t age well with time). But yeah, at least they didn’t portray them as bombing terrorists or whatnot. I wonder how the live-action remake will be. I should also mention that my father was born Muslim, but converted to Christianity long before I was born (and, as mentioned before, my mother raised me as a Jew), so what little accurate knowledge of Muslim culture I do possess comes from what I’ve learned from other sources. Well, if you ever do that, I’d love to support that film in any way that I can. I’m unfamiliar with The Sabbath Lion. I often thought if we could have a Muslim equivalent of Fiddler on the Roof, it would be awesome! So you technically have ties to all 3 Abrahamic faiths, lol? You wanna know something strange I’ve noticed about ALADDIN? They can’t seem to decide on which font to use for the film’s title. Click on the links below, and you’ll see what I mean. Oh wow, I never noticed that before! Previous Previous post: Want to Help a Fellow Lover of Animation With His Dream Project?